Posted on Saturday, April 7th, 2012 at 1:12 pm. Check out this Kickstarter campaign for a film by Rosemary Williams about Rosemary Williams starring Rosemary Williams. Rosemary Williams is also cooking up a storm with her Mom’s Cookies projection for Northern Spark. Posted on Tuesday, July 19th, 2011 at 9:47 pm. Battle of Everyouth by Ali Momeni and Jenny Schmid with students from Washburn High School was presented at Northern Spark. 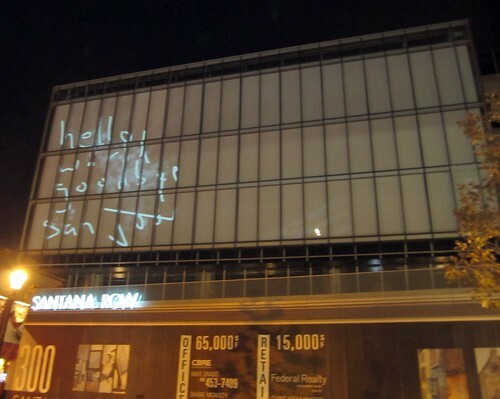 It is a projection-based performance staged at multiple sites on and around the Minneapolis Institute of Arts , which is blend of live cinema, participatory theater and live performance. The Battle of Everyouth creates a context for exploration and conversation on the theme of global youth and violence. 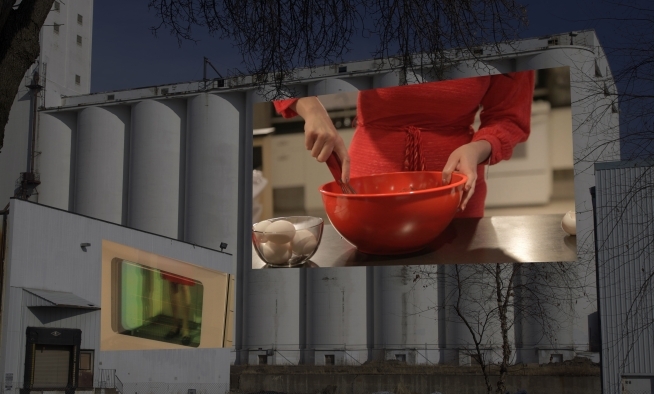 A “mixing station” staged in front of the museum produces large-scale panoramic projections onto its facade using live video feeds from numerous dispersed performance contexts. 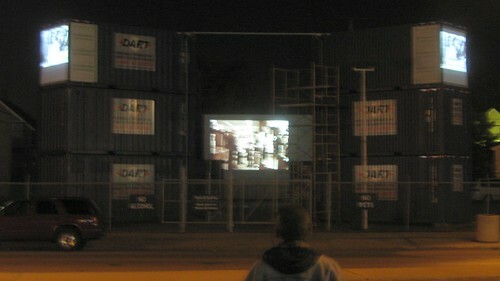 The performance contexts that generate the raw materials of the projection are centered around a miniature urban set on display outside the museum. These performance contexts are run by students from Washburn High who act as the messengers as well as the listeners in this work. They use two types of devices in their interactive rapport with the public, which are both mobile and wireless. The first is an ornate hat, which is designed to capture up-close video footage of faces. The second is an augmented briefcase used to capture writing and drawing with markers. Video feeds from these interaction devices are projected onto architectural components in the miniature set, and simultaneously recorded and manipulated by Momeni and Schmid as they project at large scale onto the museum. MIA Inside/Out: Battle of Everyouth is made possible by a Joyce Award and a grant from the Friends of the Institute with additional support from Best Buy Children’s Foundation. Presentation of The Battle of Everyouth at Northern Spark is also made possible in part by a grant provided by the Minnesota State Arts Board, through an appropriation by the Minnesota State Legislature from the Minnesota arts and cultural heritage fund with money from the vote of the people of Minnesota on November 4, 2008. Posted on Thursday, July 7th, 2011 at 8:19 pm. I have to admit I love most of Karolina Sobecka’s work. This new responsive, generative lobby video with immersive sound, Forth, seems amazing. I’m sure there were functional and likely budget reasons, but it’s a little disappointing that it’s such a SCREEN, especially in contrast to a lot of her other work. Sobecka was part of the MAW residency program in 2010, and her Wildlife was a big hit at the inaugural 01SJ Biennial/ISEA Symposium. Posted on Wednesday, May 11th, 2011 at 8:44 pm. All My Relations Arts invites you to join us for a community conversation with local Native American artists Mona Smith, Bobby Wilson and Robert Two Bulls. They will be talking with guest artists Rigo 23, whose work Oglala Oyate will screen during the Northern Spark festival at AMRA. Joining them will be Tom Poor Bear from Pine Ridge Indian Reservation in South Dakota. Poor Bear worked with Rigo 23 and appears in the video. Curator and poet Heid Erdrich will moderate. Light refreshments will be served. Posted on Monday, February 21st, 2011 at 10:16 pm. Posted on Saturday, October 9th, 2010 at 11:10 pm. Bring to Light from Max Tiberi on Vimeo. Brooklyn Street Art: We’re always talking about the intersection of Street Art, Urban Art, Public Art, Performance, Projection Art – do you think that there is a growing interest among city dwellers in reclaiming public space for art? Ken Farmer: I think there is a growing interest in authentic, and interactive public art. We are in a beautiful era of D.I.Y. culture. The big, corporate commissioned public art pieces in lifeless lower Manhattan plazas are old news. People want something more relatable and more dynamic. We are seeing a proliferation of low-cost, pop-up elements in public spaces. Some may see it as art, others as amenity, either way…its terrific. Interesting interview with the organizers of the recent NYC nuit blanche, Bring to Light. See also Bring to Light and Northern Spark. Posted on Wednesday, October 6th, 2010 at 11:30 pm. 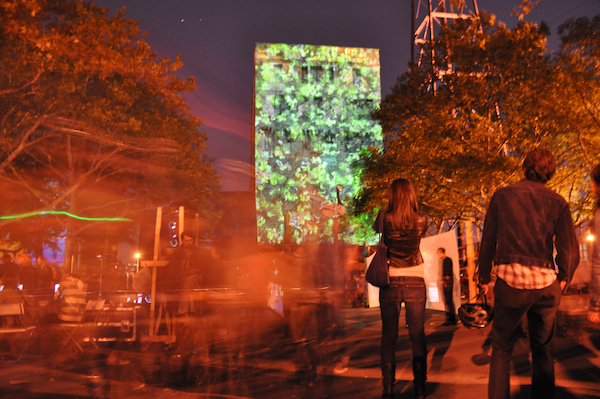 On October 2, 2010, the first ever nuit blanche, Bring to Light, took place in New York’s Greenpoint. Hyperallergic has a nice photo essay of the event. Minnesota’s first ever nuit blanche, Northern Spark, takes place June 4, 2011. Today’s question – What is your dream for the future? Posted on Tuesday, September 21st, 2010 at 8:36 pm. I’m heading home after an amazing 01SJ Biennial. 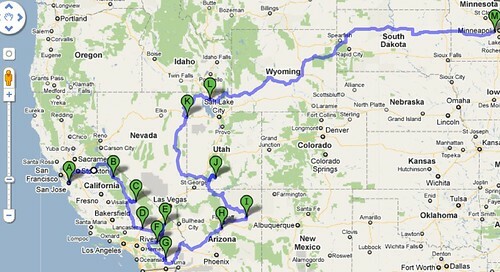 What should I see on the way? What should I see on the way? Posted on Tuesday, August 10th, 2010 at 12:20 am. Follow the Mobile Shadow Projection Theater’s bike / performance to Duluth online. Posted on Saturday, May 15th, 2010 at 6:53 pm. Wing Young Huie, University Avenue Project(ion) site. Courtesy the artist. Photographs by Wing Young Huie are installed over 6 miles of University Avenue in Saint Paul for The University Avenue Project…an extraordinary public exhibition that is on display in storefronts and on building facades May 1 – October 31, 2010. At the center of the exhibit is The University Avenue Project(ion) Site, located at 1433 University Avenue. On a nightly basis beginning at dusk, Wing’s photographs are projected on 40’foot screens, accompanied by a soundtrack from local musicians. The last Saturday of each month, we invite local talent to take the stage for The University Avenue Project Cabarets. Volunteers must attend a 1.5 -hour training session on Thursday, May 27th from 5:00-6:30pm or Friday, May 28th from 2:00-3:30pm. Volunteer Training will be held at the Project(ion) Site, 1433 University Avenue. Volunteers must be available to work on the Project(ion) Site during evening hours. For the month of June, standard volunteer shifts are 8:15pm-10:45pm nightly. At special events, such as the Cabarets, volunteer shift times change slightly. Volunteers must be able to lift up to 20lbs to assist with site set-up. There are two shift options for the Cabarets. Shift 1: 6:00pm-8:30pm Volunteers will assist with site set-up, public information and outreach, and smooth running of the Cabaret line-up. Shift 2: 8:15pm-10:45pm Volunteers will assist with smooth running of the headlining Cabaret act and stay through the completion of the Project(ion). 1.5 hours for training session on either May 27th or May 28th at The Project(ion) Site, 1433 University Avenue, Saint Paul. 6+ Hours – Volunteers will be asked to complete at least two volunteer shifts. Public Art Saint Paul will work with you to coordinate a schedule. To sign up for Project(ion) site shifts throughout the month of May, please visit the Get Involved section of the project website www.theuniversityavenueproject.com. Posted on Sunday, May 2nd, 2010 at 12:38 pm. Last night was the magnificent “culmination” of years of photographing University Avenue in Saint Paul, MN, by artist Wing Young Huie. Four years in the making, tenaciously midwifed by Public Art Saint Paul, The University Avenue Project is a major public art installation with hundreds of photographs posted in businesses along 6 miles of the Avenue. Hundreds of people came to the “Project(ion) Site,” at 1433 University Avenue, conceived and produced by Northern Lights.mn with MS&R Architects, where a nightly slide show of Wing’s work can be seen accompanied by a rotating soundtrack of MN-based musicians through October 31. Posted on Saturday, May 1st, 2010 at 11:21 am. Northern Lights was invited by Public Art Saint Paul and Wing Young Huie to participate in Wing’s University Avenue Project by proposing a “Project(ion) Site,” where there will be a nightly 2-hour show beginning at dusk of more than 450 of Wing’s photographs, which he has taken over the past 4 years, and which are exhibited along a 6-mile stretch of University Avenue. The show begins tonight, Saturday, May 1, at 8 pm at 1433 University Avenue, and runs through October 31. More details. Posted on Wednesday, December 9th, 2009 at 9:55 pm. Who knew the CO2 Cube is created out of shipping containers? C02 Cube. Image via Obscura Digital via Curbed LA. “Is there anything shipping containers can’t do? Here they are arranged on a barge in St. JÃ¸rgens Lake in Copenhagen to visually represent one metric ton of carbon dioxide stored at standard atmospheric pressure. An average person in an industrialized country puts that amount out monthly. Posted on Tuesday, December 8th, 2009 at 11:23 pm. Rome is finally giving proper space to contemporary art. Not only between the walls of galleries and other traditional venues, but also in the streets, hosting new buildings (Zaha Hadid’s new MAXXI museum and Odile Decq’s expansion for Macro, to open in spring 2010), performances and open-air installations. Doug Aitken’s Frontier is the latest evidence of this new deal: a spectacular video work installed on the Isola Tiberina, a natural island located in the very heart of the city, emerging from the river. After the end of the show, the work will be donated to Romeâ€™s contemporary art museum (Macro), where it will be visible next year. The press releases that accompanied the launch of the event, part of the third edition of Enel Contemporanea curated by Francesco Bonami, emphasized a supposed similarity between Aitkenâ€™s video room (which has numerous small windows and no roof) and the Colosseum. But the work doesnâ€™t seem to look for any historical reference; it owes most of its appeal, on the contrary, to the visual clash it engages with the surroundings. Visitors first see Frontier from above, standing on top of the bridge, then walk down the marble stairs and approach a white, luminous room. The video is projected all over the inner walls, and the light â€“ with its intensity and colour variations â€“ leaks out of the rectangular windows that punctuate the structure. The whole architecture becomes a screen and a framework for the story: a narrative – and somehow circular – journey about memory and time. At the beginning we see the american painter Ed Ruscha sitting in a darkened movie theatre. Then he leaves for an – imaginary? – walkabout through different locations and atmospheres (the video was shot in Rome, Los Angeles, Israel and South Africa). The camera alternates wide, quiet panoramas with intense close-ups of faces and objects; the overall feeling is mystical and romantic. Sometimes the artist just relies on colours, flooding the walls with vibrant textures of pure, liquid light. At last, the protagonist finds himself once again in the same setting â€“ the cinema – where the video began. In the end, it seems like the story, and even the video itself, doesnâ€™t count as much as the whole, immersive experience. The experience of spending half an hour inside a big screen-bulding, on the tip of an old island (it resembles the tip of a vessel) with only the sky as a roof. The main role of the video is that of being an emotional trigger, gently pushing the spectator towards a dreamlike, contemplative mood. Valentina Tanni (www.valentinatanni.com) is a contemporary art critic and curator based in Rome, Italy. Her research is mainly focused on new media art and internet culture. She is the founder of Random Magazine (www.random-magazine.net) a digital art bulletin, and co-founder of Exibart.com (www.exibart.com), the most popular online art magazine in Italy.